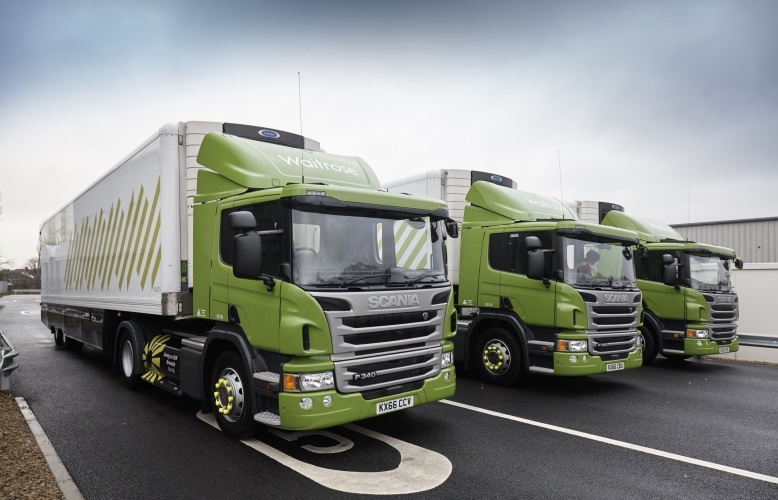 Supermarket operator Waitrose has introduced a new ten-strong fleet of trucks powered exclusively by CNG (compressed natural gas). The Scania-built trucks are the first in Europe to be equipped with twin 26-inch diameter carbon fibre fuel tanks, which store the gas at 250 bar of pressure. This increases the vehicles’ range from 300 to 500 miles, enabling them to complete round trips to Waitrose outlets in the Midlands and the North on a single fill. CNG is also 35-40 per cent cheaper than diesel and emits 70 per cent less CO2. “Using biomethane will deliver significant environmental and operational benefits to our business,” said Justin Laney, general manager Central Transport for the John Lewis Partnership, Waitrose’s parent organisation. The CNG trucks cost 50 per cent more than their diesel counterparts, but annual fuel savings of £15,000-£20,000 should see that cost recouped within two to three years. Each truck is also expected to be in service for five years longer than a diesel equivalent, giving an overall lifetime saving per vehicle of between £75,000 and £100,000. The carbon fibre tanks were adapted for the European market by Agility Fuel Solutions. They provide a weight saving of half a tonne per truck while at the same time delivering additional range. Current CNG refuelling infrastructure is limited, but expected to grow in the coming years as hauliers seek cheaper and cleaner alternatives to diesel. “High-pressure carbon fibre fuel tanks demolish the ‘range anxiety’ concerns that have made many hauliers reluctant to move away from diesel to CNG,” said Philip Fjeld, CEO of Solihull-based CNG Fuels, which supplies Waitrose. During the 60’s and 70’s diesel was far cheaper than petrol, then as diesel cars became more popular up went the price of diesel. How soon before the price of biomethane fuel follows suit? If Waitrose generates its own biomethane from its food waste then it need not worry about the price rising. The problem with “Diesel” fuel pricing is that it is very similar to Jet Fuel, Kerosene, Paraffin, Central Heating Oil, Naptha, etc. Since the 1960 & 70s plane flights and car ownership have increased dramatically, and the demand for heating fuel in USA increased significantly, hence the price of heavy fuel oil (“Diesel”) for engines often increased in winter. Naptha is split into petrol when the refinery is so equipped, but Naptha is also the feedstock for the chemical industry whose production has also increased with modern demands for plastics, etc. We had decades of gas reserves for pollution free home heating, then politicians encouraged gas to be burnt in power stations depleting the UK’s reserves from anticipated import of gas beyond 2050 to imports after 2012. I remember the calculations of increased gas usage in power stations and effects on reserves back in the 1990s. I will leave others to determine if the only consideration of the politicians, at the time, was to break the coal industry or to reduce carbon emissions. If gas reserves continue to be depleted, I expect Biogas prices to follow, or taxes on Biogas for road use to increase, if it proves popular. Gas is not ‘pollution free heating’. It’s relatively low-carbon at 180gCO2e/kWh. But that still 20 times more than a heat pump running on wind or nuclear. Meanwhile it’s mostly gas (along with some wind, PV and nuclear upgrades) that has dropped our grid intensity from 800 to 400gCO2/kWh. It needs to get down to around 50 over the next 20 years, at the same time of getting rid of (almost) all the petrol/diesel usage.